The critical care equipment for asia & north africa market is expected to reach $2.61 billion by 2021 from $1.78 billion in 2016, at a CAGR of 8.0% during the forecast period. Continuous technological advancements in critical care devices, increasing government support, growing private sector investments in the healthcare industry, and increasing patient population base are key factors fuelling the growth of the north africa critical care equipment market in the emerging nations. High replacement rate of critical care devices, growing medical tourism in Asia, and development of multiparameter monitors are some other prime factors offering growth opportunities for players in the critical care equipment market. However, high cost of these devices is restraining the growth of this market. Asia and the Middle East and North Africa (MENA) region offer high-growth potential for companies engaged in the development and marketing of critical care devices to hospitals and clinics. Growing geriatric population, increasing cases of chronic and respiratory diseases, growing number of local manufacturers, and increasing number of super-speciality hospitals are the key factors propelling the growth of the north africa critical care equipment market in the emerging countries. A combination of bottom-up and top-down approaches was used to calculate the market sizes and growth rates of the north africa critical care equipment market and its subsegments. All percentage shares, splits, and breakdowns were determined using secondary sources and verified through primary sources. All possible parameters that affect the markets covered in this research study have been accounted for, viewed in extensive detail, verified through primary research, and analyzed to get the final quantitative and qualitative data. Primary interviews with key opinion leaders were also used to determine the percentage shares of each product in emerging nations. The report provides qualitative insights about growth rates and market drivers for all subsegments. It maps market sizes and growth rates for each subsegment and identifies segments poised for rapid growth in each geographic segment. On the basis of products, the asia critical care equipment market is divided into three segments, namely, patient monitors, ventilators, and infusion pumps. The patient monitors segment is expected to grow at the highest CAGR in the next five years, owing to the increasing patient population base and the high adoption of advanced patient monitoring devices by big hospitals and clinics in the emerging nations. The patient monitors segment holds the largest share of the asia critical care equipment market in emerging nations. The increased private sector investments and expansions, premium cost of devices, high replacement rates, and development of multiparameter monitors are the key factors contributing to the growth of this market segment. Moreover, development of patient monitors with wireless and sensor technology and rising adoption of home-use and remote patient monitoring devices are other factors contributing to the growth of the patient monitors market in emerging nations. The ventilators market segment is further categorized on the basis of products into adult ventilators and neonatal/infant ventilators. 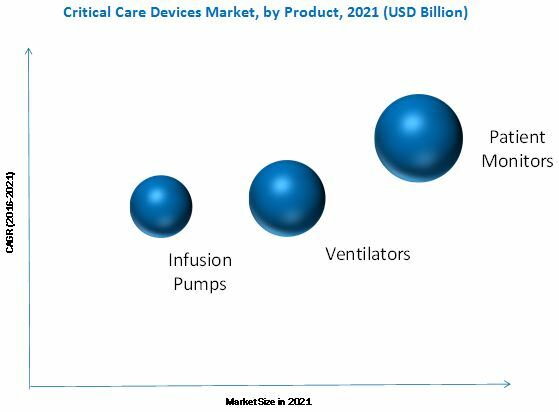 Increasing geriatric population, rising number of ICU patients in India, growing use of home care ventilation devices, and increasing prevalence of respiratory devices are key factors driving the market for adult ventilators in the emerging nations. Whereas, increasing incidence of pre-term births in emerging nations is a key factor driving the adoption of neonatal ventilators in these regions. However, shortage of ICU beds and high adoption of refurbished products are shrinking the revenue growth of this market. The infusion pumps market, on the other hand, is driven by factors such as rising geriatric and obese population resulting in the growing prevalence of chronic diseases in India, increasing number of hospital beds, and introduction of smart infusion pumps which are propelling the growth of the infusion pumps market in emerging nations. However, high cost of infusion pumps and rising adoption of refurbished infusion pumps are the key factors restraining the growth of this north africa critical care equipment market. Geographically, the global market is classified into Asia (excluding India), India, and the Middle East and North Africa. In 2016, the critical care equipment market is estimated to be dominated by Asia. Rising demand for remote patient monitoring, high adoption rate of technologically advanced critical care devices, and increasing patient population base are contributing to the large share of the Asian critical care equipment market. The Indian market is expected to grow at the highest CAGR from 2016 to 2021. Factors such as growing government support, increasing private sector investment, rising geriatric population, growing incidence and prevalence of respiratory and chronic diseases, and developing healthcare infrastructure are propelling the growth of the Indian critical care equipment market. Geographic expansion is the primary growth strategy adopted by major players to increase their presence in the Indian critical care equipment market. Moreover, strategies such as new product launches and product enhancements; partnerships, agreements, and collaborations; and acquisitions were also adopted by a significant number of market players to strengthen their product portfolios and increase their visibility in the critical care equipment market. Koninklijke Philips N.V. (Netherlands), General Electric Company (U.S.), Medtronic plc (U.S.), Drägerwerk AG & Co. KGaA (Germany), Skanray Technologies Pvt. Ltd. (India), Maquet Holding B.V. & Co. KG. (Germany), BPL Medical Technologies Ltd (India), B. Braun Melsungen AG (Germany), Akas Medical (India), Smiths Medical (U.S.), Nihon Kohden Corporation (Japan), and Fresenius Kabi (Germany) are some of the key players operating in the Indian critical care equipment market.